Dave Morey put together an amazing 10-at-10 today featuring 10 Bond Themes. I sort of live blogged it in my Facebook status comments, but I'll recreate it here. Rather then embed 10 video clips, the song titles all link to the opening title sequences on YouTube (except for the most recent which just links to the music video). Fortunately someone has posted all of the Bond opening title sequences. 10:05am Song #1: James Bond Theme by the John Barry Orchestra: Originally written for a musical! 10:06am Song #2: View to a Kill by Duran Duran: The only bond theme to hit #1 on the charts. 10:10am Song #3: You Only Live Twice by Nancy Sinatra: Connery's first of 3 "Final" Bond films. 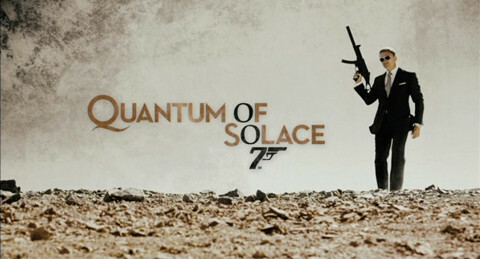 10:13am Song #4: Another Way to Die by Alicia Keys and Jack White: From Quantum of Solace opening today! 10:22am Song #5: Goldfinger by Shirley Bassey: Can't get any better than this one: gowldFINGAHHH!! 10:22am Song #6: Living Daylights by A-Ha: One of my favorites. You didn’t know A-Ha did anything other than Take On Me? 10:26am Song #7: Nobody Does it Better by Carly Simon and Marvin Hamlisch: One of the best love songs ever. Bet you didn't even know it was a Bond Theme? From the Spy Who Loved Me. 10:32am Song #9: For Your Eyes Only by Sheena Easton: The only theme performer to actually appear in the opening credit sequence. 10:37am Song #10: License to Kill by Gladys Knight: Good song for a sub-par, overly earnest Bond Film. Timothy Dalton's last. 10:42am And Best-of-Set goes to... Goldfinger, of course! 11:20am Bonus Track: Secret Agent Man by Johnny Rivers. Never in a Bond film, but in the same spirit.